fish/ TROPICAL FISH/Clown Knife Fish. 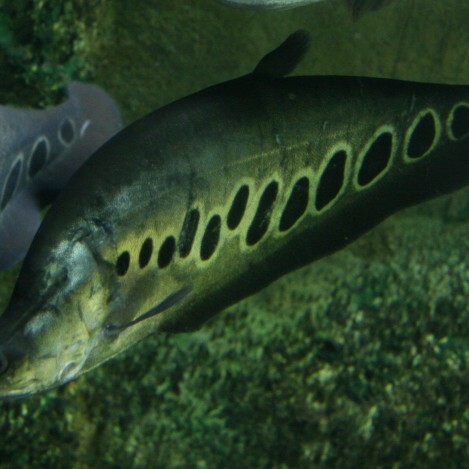 The Clown Knife fish scientific name is Chitala ornata, they are also known as the clown featherback, or spotted knifefish. They are best kept in water parameters of PH 7.2 – 7.6. Water temperatures of 75 to 85 °F (24 to 29 °C). They can grow to large sizes up to 1 meter, 3.3 ft fully grown. The clown knife fish is a bottom dwelling fish, they like to hide a lot so do require hiding places. They are a nocturnal fish as they are more lively when the lights are off. They are best mixed with bigger fish, as they can eat smaller size fish that can fit in to there mouths, plus the sizes they get they do need require a big tank. They are best either mixed on there own, or as a pair as they can fight with one another if there is not enough space for them. They will eat any foods that sink to the bottom but they do need frozen or live foods in there diet. They will eat any food you put in the tank, they require sinking foods. They do need frozen or live foods in there diet.